Blend in cilantro,mint,green chillies & ginger to fine liquid by adding water. Add in lemon juice,salt, sugar & chat masala to the blended liquid. Peel & boil the potato & crush it. Sprinkle in a little chat powder, chilli powder & salt on the potato & keep it separate. To assemble to dish make a small hole in the middle of the poori. Stuff the potato mix in the middle of the poori. Top it up with chopped raw onion which adds flavour. It can be skipped for ones who are not comfortable with raw onions. When ready to eat add the stuffed poori with the green liquid & serve. oooh! my favorite!! the pani looks delicious and mouth watering! I am so craving these right now. I am getting some puris when I goto the Indian store. Ohhhhhhh I want to have them. WOW... This is my fav. Looks so good. Tempting pictures. So mouthwatering... YUM! yummy! looks nice. i make sweet chutney as well for this. My Fav too. Love the picture. Thank you for adding me, added you to my blog roll too. 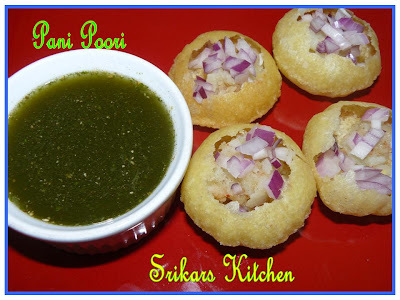 Am craving for pani poori now seeing yours! my mouth is watering.. im drooling at the pic.. i have never had home made pani puris. Always outside, just had them yesterday night at the dandiya celebrations. but your pic and recipe makes me want to try it right away! Happy Dusshera to you and Your Family Sri!!! 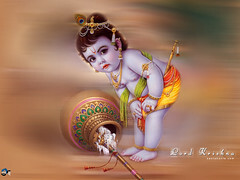 Like many of the gals here I am also craving for those pani puris,as ita my 1st favorite snack! OMG can u plz pass me ur plate ??? looks mouth-drooling!!! I so wish I could pop some of those into my mouth NOW!!! Tempting, delectable, alluring, divine, these are the words comming to my mind by looking at those awesome pani pooris.